I have a valid German national visa (Type D) (valid March 1-August 31, 2017), and I am a Filipino Citizen. We cannot visit Turkey without purchasing an e-Visa and without a valid Schengen Visa. Can I go to Istanbul first before actually going to the Schengen area? Assuming you wish to enter Turkey and not merely transit through, you may. 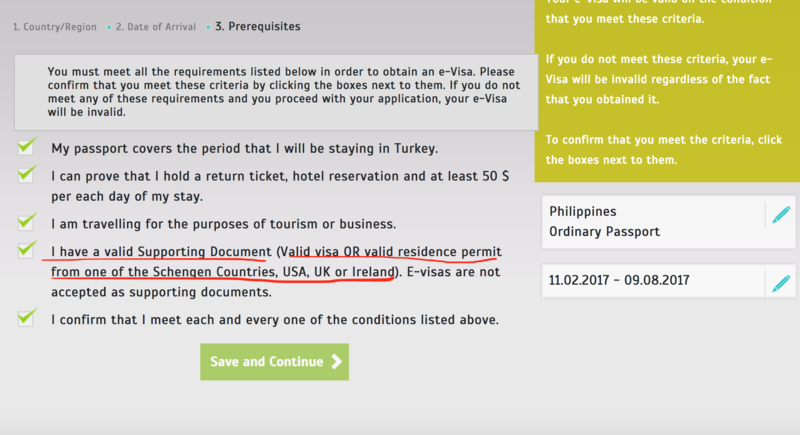 Nationals of Philippines with a normal passport can obtain an e-visa before departure at www.evisa.gov.tr if they have a valid on arrival visa or a residence permit issued by Ireland (Rep.), USA, United Kingdom or a Schengen Member State. Visitors who require a visa, must also hold proof of hotel reservation and documents for their next destination. Visitors exceeding the period for which they are allowed to stay must report to the immigration police and obtain a permit of residence ("Ikamet Vesikasi") which must be produced upon departure. Visitors who require a visa and do not hold return/onward ticket could be refused entry. A Schengen D visa counts as a residence permit within the Schengen area. An e-Visa ($20) would be valid for a single entry of up to 30 days from the date of arrival in Turkey but may be extended if you apply to your local Police Station for a residency permit. Your passport must contain at least one unused visa page and have an expiration date at least 60 days beyond the “duration of stay”. Not the answer you're looking for? Browse other questions tagged visas turkey filipino-citizens e-visas or ask your own question.